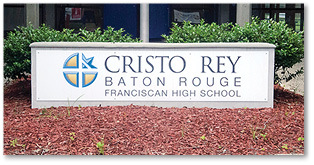 Cristo Rey Baton Rouge Franciscan High School in Baton Rouge is coming home, and much sooner than anyone expected. Crisco Rey president Brian Moscona could hardly contain his excitement as he relayed the news on March 23 that the school, which was driven from its north Baton Rouge site by floodwaters this past summer, should be operational in August with the utilization of temporary buildings. “That’s our plan,” a beaming Moscona said, after learning only moments earlier that Cristo Rey was awarded a $500,000 flood recovery grant by the United States Conference of Catholic Bishops. The grant, along with confirmation from FEMA that the agency will pick up 90 percent of the costs of establishing a modular campus, all but assured Cristo Rey will return to the site of the old Redemptorist High School, which the diocese has donated to the school. Cristo Rey, currently in its first year, opened in August, 2016 only to be exiled to Bon Marche Business Park by the historic flooding that left up to four feet of water in the school. “This grant allows us to have confidence going back to the site because we’re still able to pay 10 percent of the cost for the (temporary) buildings,” said Moscona, who only recently took over as president after the sudden retirement of Dr. James Llorens this past fall. Moscona said because so many schools in the area flooded during August the companies are familiar with the unique demands and timelines of establishing a temporary school. He also noted he recently went through a similar experience a year ago when he was principal at Our Lady of Mercy School in Baton Rouge and 12 modular classrooms had to be set up. “So I have a lot of relations I can go to and make this happen,” he said. Cristo Rey board chairman Vic Howell said he has been told by FEMA representatives the agency views the reestablishment of schools as critical community elements. Cristo Rey has hired a contractor to act as a liaison between the school and FEMA to help cut through the red tape, a process many residents have become quite familiar with during the past six months. Groundbreaking on a new school appears to be at least a year away and will depend on what FEMA grants to the construction as well as a Cristo Rey capital campaign. Howell said FEMA uses a complex formula to determine the amount of funding the school will receive. Estimates for construction of the new school range from $8 to $10 million, but the final amount needed to be raised will remain unknown until FEMA makes its final determination. “When we initiate a capital campaign we are going to be looking to the Baton Rouge community to support the work that we are doing,” Moscona said. “The students of the families that we serve are not going to be the ones that are going to be able to pay for this. So we’re looking for support from the community who believe in our mission, who want to support north Baton Rouge.